I am not one of those who thinks that Bolton has absolutely nothing positive to offer the country as national security adviser, and below, I’ll outline what I believe his strengths to be. But as readers will see, I think that the bad outweighs the good, and that while John Bolton is not as miscast as national security adviser as Donald Trump is as president, we would have been better off if Bolton decided to continue as a Fox News pundit, rather than becoming one of the key decision makers in the White House Situation Room. John Bolton is a very smart and experienced foreign policy and national security figure. Bolton is very familiar with foreign policy and national security issues, and is, by accounts of even those who are horrified by his views, highly intelligent and capable. He does his homework on the issues of the day, and makes sure to know more about those issues than do his interlocutors More on this below. John Bolton knows how to work the bureaucracy in order to get what he wants. As with the previous point, more on this below.
. . . contrary to his trigger-happy anti-diplomatic reputation, Bolton quickly set about building a nonproliferation framework that avoided the foreign policy establishment’s earlier mistakes. The Proliferation Security Initiative didn’t rely on endless multilateral set piece negotiation leading to a treaty. Instead, Bolton identified a group of like-minded European countries, and in 2003, this coalition of the willing signed on to a coordinated campaign to interdict shipments of missiles and weapons of mass destruction. Without a treaty, each country agreed to do what it felt was authorized under international law,—a pledge that Bolton cleverly expanded by making international law himself, negotiating bilateral ship-boarding agreements with the main countries supplying flags of convenience to merchant vessels. We could do worse, quite frankly, than to replicate the process that led to the creation and implementation of the Proliferation Security Initiative in dealing with other knotty foreign and national security problems. John Bolton helped reverse one of the most infamous decisions in UN General Assembly history. In November, 1975, the United Nations General Assembly passed a resolution equating Zionism with racism. But during the administration of George H.W. Bush, the United States reversed that stance. John Bolton was invaluable in having helped bring about that reversal. Frankly, civilized and decent people everywhere should be grateful for his efforts. Unlike Donald Trump, John Bolton will actually be tough on Vladimir Putin and Russia. Plenty of evidence for this proposition can be found; here is but one article summarizing Bolton’s position on Putin and Russia. If Bolton can actually turn around Trump’s “thinking” regarding this issue, I would be quite pleased, though it is worth emphasizing that Trump’s softness on Russia may have something to do with the fact that the Russians have blackmail material on Trump. So much for Bolton’s good points. And now for the less flattering portions of his background.
. . . The Trump White House is something of a clown show, but Bolton is no clown. Rather than just adding a Fox-newsy ideologue who shifts the balance of the administration team’s view further toward the president’s most hawkish outlook, Trump has added someone who can actually help him make that outlook into reality.
. . . Bolton brings to the president’s national security agenda a competence that this White House has lacked. I generally agree with Benjamin Wittes that some of the president’s worst instincts have often been tempered by sheer ineptitude. What makes Bolton dangerous is his capacity to implement those instincts effectively. John Bolton is tempering actually laudable policy positions in order to curry favor with Donald Trump. Unlike Trump, whose trade policy positions are nothing short of odious and immiserating, Bolton has historically been a free trader. As a free trader, I find this to be welcome and outstanding, but unfortunately, Bolton is well into the process of acclimating himself to Trump’s views. Matthew Waxman’s link above states that Bolton is clever and careful about the fights that he picks; I cannot quite see him picking a fight with protectionists in the Trump administration–including Trump himself–regarding trade policy, so I fear that the new national security adviser will do little to nothing in order to turn Trump around on this issue. In August of 2002, as George W. Bush and his allies were building the case for regime change in Iraq, Scowcroft warned in a Wall Street Journalop-ed that an attack on Iraq “would seriously jeopardize, if not destroy, the global counterterrorist campaign we have undertaken.” Though Scowcroft was confident that the U.S. could succeed in destroying Saddam’s regime, he was also confident that military action would be expensive and bloody, and that it “very likely would have to be followed by a large-scale, long-term military occupation.” As we all know, Scowcroft’s warning went unheeded by the Bush White House. Scowcroft offered another warning in America and the World, a widely ignored book published in 2008 that collected a series of exchanges between Scowcroft and his fellow foreign policy wise man Zbigniew Brzezinski. Recognizing that Iraq remained riven by communal conflict, Scowcroft arguedthat the country would continue to need a U.S. military presence for at least a few more years. Under Saddam, Iraq’s Shia plurality was subjugated by its Sunni minority. The fear among Sunnis has long been that once the Shias come to power, they would be the victims of all manner of reprisals. A similar dynamic has long been at play in Syria, where the Assad regime, closely tied to the Alawite minority, rules over a Sunni majority. It also played a role in the Bosnian civil war, where various ethnic groups fought desperately to avoid minority status, which many believed would amount to a death sentence. This desire to escape subjugation has been the central driver of the various Sunni insurgencies that have rocked Iraq for more than a decade. Some Sunni militants seek not just to avoid oppression and brutality at the hands of Shias but to reassert their dominance, often on the grounds that Shias are deviants or apostates. These are the true bitter-enders, for whom no compromise is possible. Most of Iraq’s Sunnis, however, see themselves as essentially defensive in orientation, and willing to lay down their arms if they are promised the right to live in peace. It is only when U.S. officials came to understand the crisis in Iraq as a communal civil war that they knew what they had to do to contain it: reassure the Sunnis that the Shias would do them no harm, if only because U.S. forces would keep Shia sectarianism in check. As Scowcroft explained to Voice of America News in January of 2012, just weeks after withdrawal was complete, Iraq’s political leadership still needed to learn to make compromises among various ethnic, sectarian, and ideological factions. And in his view, “those compromises are probably easier to make in the embrace of a U.S. presence.” The end of the U.S. presence meant that these compromises were less likely, and that a war of all against all was much more likely. It is important to emphasize that Scowcroft was not calling for a permanent U.S. presence in Iraq. Rather, he believed that the post-Saddam Iraqi state needed time to get on its feet, and its new elected rulers needed time and breathing room to repair trust among communities that had spent so long at each other’s throats. By contrast, Bolton’s views regarding the Iraq war are entirely unchanged, which should cause significant concern and alarm amongst observers. In the face of the greatest strategic error committed by the United States since the decision to prosecute the Vietnam War, Bolton’s views are inflexible–either because Bolton is too embarrassed to climb down from his position supporting the Iraq war, or because Bolton genuinely believes that il ne faut rien regretter. Of course, it ought to go without saying that Bolton’s unwillingness to admit error in Iraq means that a similar error could be committed by the United States elsewhere in the world, while Bolton serves as national security adviser. And that leads to . . . In a letter sent last month, the Joint Chiefs of Staff informed us that, should hostilities erupt on the Korea peninsula, a ground invasion of North Korea would be necessary in order to locate and destroy its nuclear sites. They also noted that Seoul and its 25 million residents are only 35 miles from the border and well within range of North Korean artillery, rockets, and ballistic missiles. In short, a Korean War II would be bloody. According to a Congressional Research Service report, in just the first few days of fighting, as many as 300,000 people could perish. Indeed, even if North Korea elected only to use conventional weapons, American troops would die in large numbers alongside South Korean forces and masses of innocent civilians. Raise your hands if you believe this, and I’ll be sure to contact you about selling you a bridge in Brooklyn and a degree from Trump University. The two words that most closely follow any mention of Brent Scowcroft’s name is “honest broker.” Does anyone really believe that to be true of Bolton, what with his past record of interacting with those who disagree with his views? Mr. Bolton was preparing for a speech in which he would accuse a range of nations, including Libya, Iran, Iraq, North Korea and Syria, of possessing chemical and biological weapons when he sought clearance from the intelligence officials for an assertion he wanted to make that Cuba was developing a biological weapons program, a claim that was not, in fact, fully supported by American intelligence. 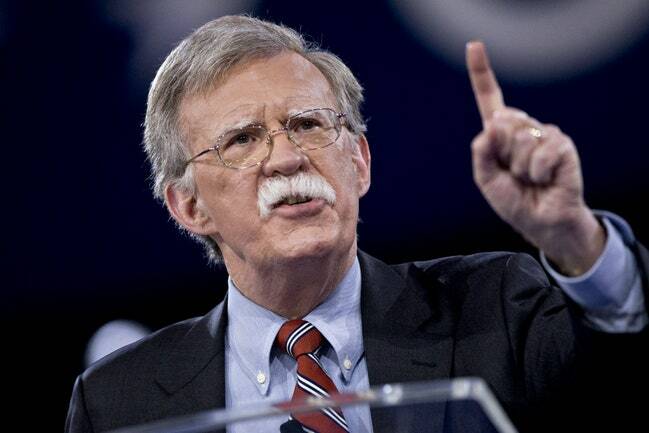 Christian Westermann, a State Department intelligence analyst specializing in biological and chemical weapons, and an unnamed national intelligence official responsible for Latin America disagreed with the claims about Cuba that Mr. Bolton sought to make. The next day, Mr. Ford, who had run the bureau where Mr. Westermann worked, rattled the committee by describing Mr. Bolton as a “serial abuser”of lower-level staffers. Rexon Ryu, a former State Department official, told the panel he encountered Mr. Bolton’s ire after he neglected to forward a cable related to United Nations weapons inspections in Iraq. Mr. Bolton then tried to block Mr. Ryu’s appointment as a liaison on nonproliferation issues. Mr. Ryu was transferred elsewhere at the State Department, and then recently joined the staff of Senator Chuck Hagel of Nebraska, a committee Republican. The unnamed national intelligence officer for Latin America was revealed to be Fulton Armstrong, who in an interview last week said that Mr. Bolton had targeted him for “vicious attacks,” “rumor campaigns” and “infantile” character assassination. It also emerged that Mr. Bolton had prevented Ms. Rice and her predecessor, Colin Powell, from seeing some State Department findings crucial to drafting policy on Iran, and had kept Ms. Rice out of the loop as he worked to replace Mohamed ElBaradei, the director general of the International Atomic Energy Agency, seen by Mr. Bolton and his administration faction as too soft on Iran. The panel also learned that Mr. Bolton had bullied intelligence analysts who made more conservative assessments of Syria’s illicit weapons programs in the run-up to a 2003 speech and had requested classified intercepts from the National Security Agency, including the names of American companies and officials, raising concerns that he was seeking information about ideological opponents. All this began on April 8, when Townsel wrote to the committee about an incident she says occurred while she was working for a private contractor on a U.S. Agency for International Development mission in Kyrgyzstan, a former Soviet republic. It was her job in the summer of 1994 to sell the economic reformation of that country, creating TV programs and T-shirts and even comic books informing citizens how to use their new privatization coupons that, more or less, gave them ownership in the formerly Communist republic. In 2016, Bolton played a crucial role in Frank Gaffney’s rehabilitation inside the conservative movement. For close to two decades, Gaffney has been Washington’s most dogged peddler of anti-Muslim conspiracy theories. He’s traveled the country testifying against the construction of mosques, arguing that since Islam is a totalitarian political ideology, not a religion, American Muslims don’t deserve the protections of the First Amendment. Bolton’s intervention on his behalf is particularly intriguing because, in his own writing and remarks, he’s largely avoided anti-Muslim bigotry. But in today’s conservative movement, anti-Muslim activists are a legitimate constituency group, like people who support gun rights or oppose abortion. And Bolton has proved, in this case and others, all too willing to empower them. The striking thing about Bolton’s push for Gaffney’s reinstatement is that Bolton hasn’t generally echoed Gaffney’s conspiracy theories. In fact, Bolton has largely avoided anti-Muslim bigotry in his own public statements. He even publicly opposed Trump’s 2015 proposal to ban Muslim immigration. More on this issue here. What possible benefit does it serve for the United States to have the incoming national security adviser to the president hang around and spend precious time with such crazy people? John Bolton has shown no ability whatsoever to design and implement a grand strategy for the United States. For nearly two decades, the United States has suffered from strategic drift that has allowed for rival nation-states to lessen America’s ability to dominate global affairs. Even now, the United States has no peer competitor, but that could change if the current state of strategic drift continues. For all of his intelligence and familiarity with foreign policy/national security issues, Bolton has shown no ability whatsoever to formulate and put into place a grand strategy for the United States. At best, he puts forward in his many writings and speeches ways in which the United States can address a host of individual problems. But he doesn’t tie together his views into a big picture piece to guide American policymaking and policy implementation. Perhaps he is uninterested in doing so. Perhaps he simply cannot. But in any event, the national security adviser to the president ought to be a formidable strategist. Bolton does not fit the bill. Is bound and determined to wreck a highly successful free trading system that has led to better lives for millions of people in this country, and the world over. It is astonishing that these two are working together. To be sure, Trump probably has no idea whatsoever what Bolton stands for and the degree to which Bolton’s views diverge from Trump’s; the president probably just likes Bolton because Bolton’s presence as national security adviser will help in the Fox Newsification of the United States government. But perhaps, someone ought to tell Trump that in many ways, Bolton’s record and career in government is a rebuke to just about everything Trump ran on in the 2016 campaign. Among those who have soured on him is George W. Bush. “I don’t consider Bolton credible,” Bush told a group of conservative writers, including me, in the Oval Office in 2008. If the president who sent him to the United Nations can change his view of Bolton, so can I. And so can I. America deserves better than John Bolton.